Join now and get a welcome bonus of 150% up to $1200 + 20% Cash Back! Full Flush Poker is tested and approved! Attention: Currently, Full Flush Poker is experiencing difficulties and we would not recommend depositing funds at this site until these are resolved. We are monitoring the situation and will advise once it has regularised. Until then, seek out one of our top rated poker sites. All links from this page will go to our top rated US poker site, BetOnline. You can click this link to read the Betonline Poker review. Fast Cashouts which are reported to average 24-72 hours! Full Flush Poker is part of the Equity Poker Network (EPN), which is under the ownership and management of Equity Marketing. Fully licensed and regulated? Licensed in Curacao Full Flush uses 128-bit SSL encryption and the latest in RNG technology. Fast, Reliable Withdrawals in just 3 days - many done much faster. ? All legitimate, real-money poker sites like Full Flush Poker have strict anti-fraud screens, and that may create a short withdrawal delay. Make your first deposit and Full Flush Poker will match it 150% up to $1200, so deposit $100 and they'll give you $150 extra. Plus you can now get 20% cash back. You earn your bonus simply by signing up and making your first deposit. ? Your first bonus may be used on each of your first 3 deposits up to $1200 total. Please read the terms and conditions carefully. Full Flush Poker is part of the Equity Poker Network (EPN), which is under the ownership and management of Equity Marketing. The site is licensed in Curacao and powered by software from Playsafe Holdings AS, a Norwegian poker software provider. 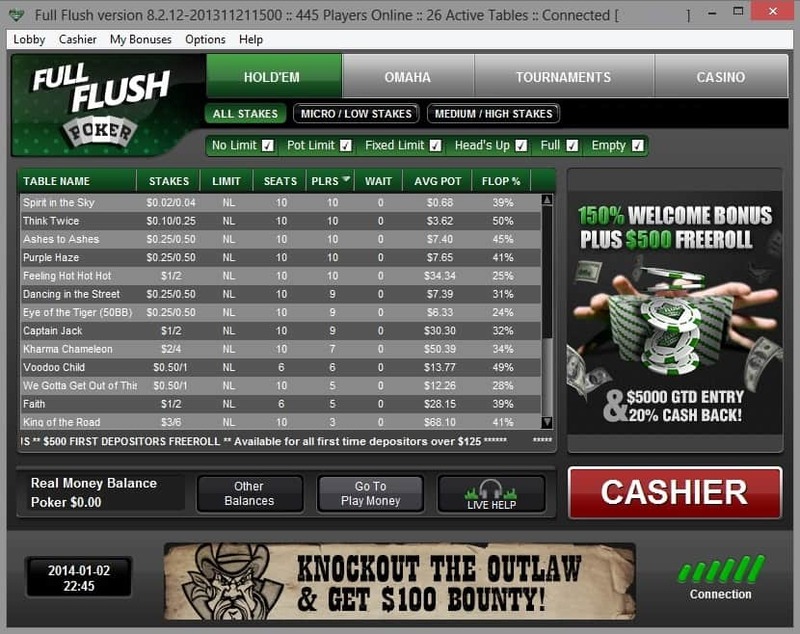 If you never heard of Full Flush Poker, it is understandable, considering how new this site is. After a soft opening in September, 2013, the formal launch for real money play took place in November. Time will tell how well this new poker room catches on and whether it is as good as it purports to be. Meanwhile, the early favorable reports from users give no reason to doubt the site's reassuring claims of fairness and security. However, when we conducted our Full Flush Poker review we could not see any evidence of independent verification and certification on their website. Your flush won't beat a full house in any poker game, except maybe at Full Flush Poker, if the player holding the latter doesn't know he or she has one! And that is very possible, considering how this place is rampant with poor players. The good news for you is that even with minimal skill, more often than not, you should be able to run over the weak competition. But there are also two downsides. The first is that the games might not be sufficiently challenging for you to sharpen your own skills. The second is that when you are up against players who see every flop, which you will be because the cost is so cheap, you better be prepared for anything: 7-2 unsuited will turn into a monster more often than you care to remember. If you are looking for a non-shark infested place to play online poker, that can be fun and profitable at the same time, Full Flush Poker looks like a good bet. The wide choice of ring games, tournaments, and freerolls shouldn't put much of a dent in your bankroll and will appeal to new players and seasoned recreational players like. You can even play for free if you so desire. When you do make a deposit, don't forget to use our Full Flush Bonus Code: USAPOKER for an exclusive bonus. 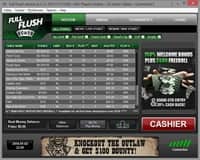 Full Flush Poker is also one of the newest online poker rooms, not only open to players from many foreign countries, but also to those of you who live in the U.S. At the present time, only three states-Nevada, Delaware, and New Jersey are legally allowed to have their own state regulated sites for playing poker and other casino games. To register and play on one of these sites, you must be physically in that casino's state at the time, and for Delaware sites, you must be an actual resident of the state. All of these casinos have software in place to immediately identify you and keep you from playing if you try to log on from another location. So if you live elsewhere in the U.S., your options to play legally are limited to just a handful of casinos, and Full Flush Poker just happens to be one of them. Full Flush Poker was set up to be a simple poker room primarily for beginners and other low stakes players. So if you are a pro or semi-pro and/or 1-2 no limit or less doesn't cut it, you are advised to look elsewhere to play. Also, the game choice is limited to the very basic No Limit and Pot Limit Hold'em and Omaha and Omaha Hi-Lo. If you wish to play 7 Card Stud or some other poker variation, you will not find it here. Two interesting features that we found in our Full Flush Poker review were the ability to check your own hand stats and take notes on other players. If you wish, you can play up to 4 tables simultaneously. The Welcome Bonus, which is a very generous 150% of your initial deposit, differs from the traditional online casino Welcome Bonus in that it is not posted to your account until after you meet the necessary play requirements. So in order to qualify, you must use your own money exclusively. The Full Flush bonus to new players from CardsChat is 150% up to $1200 plus 20% instant cash back. How do you access the Full Flush Poker Welcome Bonus? For every dollar you put into your account as your first deposit, you need to earn 20 "Player Option Points" (POP). For example, if your first deposit is $300, you will need to accrue 6,000 POPs to qualify for the bonus. You have 45 days to meet the play requirement or the bonus is forfeited. If you run out of money, you can reload your account to keep playing for the bonus, but the additional deposited money will not make the bonus bigger. You add to the POP total every time you play for real money, both in ring games and tournaments. In ring games, every 10 cents you contribute to the rake is worth 1 POP. In tournaments, every $1 you pay in entry fees or rebuys earns 10 POPs. The Full Flush Poker bonus payment arrangement is a good one for the casino and the player alike. From the casino's standpoint, it becomes more difficult for a player to abuse the bonus and try to avoid or minimize the use of one's own money. Players benefit from not having access to the bonus immediately because it helps to ensure that they bet at a level they can afford and feel comfortable handling from the outset. A bonus code is not required to receive the bonus when you sign up through our links. However, we do have a Full Flush Poker bonus code that you can use... just to be sure. 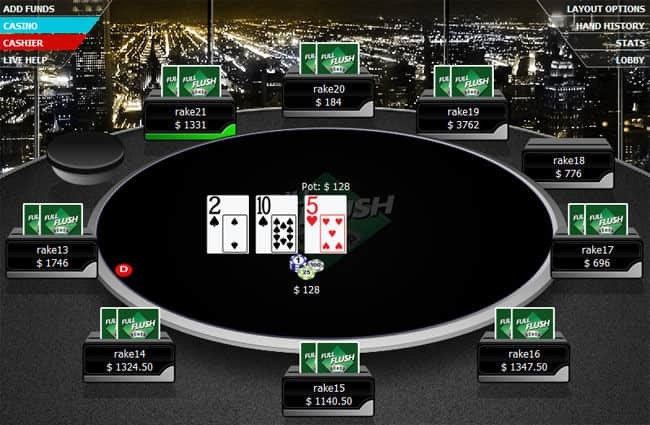 In our Full Flush Poker review we saw one area that clearly needs to improve: banking. The only deposit methods are person to person transfer and MasterCard and Visa. The only withdrawal methods are person to person (up to 24 hours), money order sent by courier (7-10 business days), bank wire (2-7 business days), and check sent by courier (1-5 business days).There are also hefty fees associated with these services. All first deposits from CardsChat.com players that are over $50 entitle you to 20% cash back and all first deposits over $125 reward you with 2,200 "promo bucks." You can use the latter to enter the Sunday Blowout $5K guaranteed tournament taking place every Sunday at 3 p.m. (ET). An alternate way to enter this tournament, in lieu of promo bucks, is to buy in for $20 + $2 or qualify by playing in a $1 +.10 satellite. For the month of January, not just the first deposit, but all deposits you make over $50 reward you with 20% cashback. Upon opening your account, you also receive 10 copper coins, which you can use to enter the First Depositor's $500 Freeroll Tournament. This tournament takes place on the last Saturday of each month at 12 noon (ET) – and don't forget to use our Full Flush Poker Bonus Code "USAPOKER" when you do deposit. Both the freeroll tournament you get to enter as a new player and any other freerolls you participate in later are not really "free." Small starting stacks and multiple rebuys permitted in the first hour of play encourage a lot of players to take all-in shots, even with nothing, early on. Then, during the first break, anyone who doesn't pay the $20 add-on forfeits $5,000 additional tournament chips, which by then will be necessary due to the rapidly increasing blinds. The guaranteed payout tournaments at Full Flush Poker are a better bet, not because the structure is better, but simply because the small number of entrants offers a great overlay. In the Sunday Blowout $5K Guaranteed Tournament, the top 20 players are in the money, The Big Deepstack Saturday $2K Guaranteed Tournament costs only $10 + $1 to enter (or 1,100 promo bucks or qualify by satellite). It allows rebuys, too, but you have a 5,000 chip starting stack and an optional $10 + $1 add-on for 10,000 additional chips. There, the top 10 players share in the prize pool. Another good reason to play the Sunday $5K and Saturday $2K Guaranteed Tournaments is a special promotion giving you the opportunity to collect a $100 bounty if you knock out a notorious poker player the casino calls "The Outlaw." There are also plenty of daily tournaments. Buy-ins range from as little as .50 + .05 to a maximum of $5 + .50.You need to plan ahead of time which tournaments you wish to enter because late entry is not permitted. The site accepts initial deposits from $25 minimum to $400 maximum. The more you deposit, the more you receive back as a match bonus as soon as you satisfy the play requirements. Also, the same POP system Full Flush poker uses to determine your Welcome Bonus is used again to reward your subsequent play. Every 100 POPs is worth .50. You can use your accumulated POPs either to buy in for tournaments or to convert into cash in your account. If you refer a friend who signs up and earns 500 or more POPs the first month, you both receive $25. If you have any questions or need help with any matter relating to your Full Flush account, Customer Support is available via live chat, phone or email 24/7. Join Full Flush Poker today and double your deposit up to $1200!